The narrow side yard running between one house and the next may seem like wasted space. There’s not enough room to do anything recreational there, and there’s not a lot of room for growing plants, either. But surprisingly, there are plenty of side yard landscaping ideas to consider. It’s actually more usable than you think. When it’s empty, it doesn’t look like much. But when you start filling it in, you realize how much more room there is than you thought. You can either landscape it to be pretty or functional, or you can even turn it into a small garden. If you don’t already have a walkway in the side yard, create one by placing some paver stones or using a mold to pour your own paver stones in place. Arrange them in the form of a path (a curvy path is nice) to the back and/or front yard. You might also want to add a reading chair or two, and maybe a table so you can enjoy it. Then you plant flowers everywhere else so you have incredible color and scent surrounding you. Flowering shrubs are also a nice option. Add a series of connected arbors and/or trellises with hanging vines along your side yard to create a romantic look. You can combine this with the “simple path” look mentioned above. Think about the entrances to your side yard. An arbor or attractive-looking gate can enhance them. 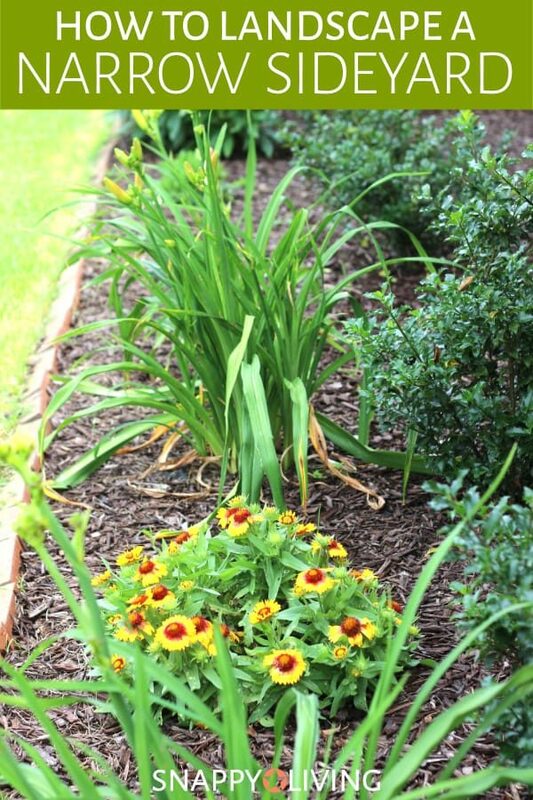 You Can Learn Series has a very detailed landscaping plan for side yards that get partial sunlight, using perennials that don’t need a lot of water or tending to stay beautiful. If your side yard gets a lot of sun, plant succulents. Choose some tall cacti, some ground-cover grasses, geraniums, etc., and put together a southwestern look for your side yard. If you have windows on the side of your house by the sideyard, put window boxes of herbs or flowers outside your windows. Sometimes dressing up the (often plain) side of your house can do a lot to improve the look of your side yard. If you have a sloping side yard that’s difficult to mow, just plant some phlox or other ground-covering plants and let them do their thing. It’ll look nice and simplify your life, all at once. If your side yard needs some privacy or shade, plant some kind of evergreens in a row. Cedars are great for anchoring the soil without spreading roots far enough to dislodge a sidewalk or paved driveway. Lombardy poplars are great as windbreaks. Many other plants will work, too. 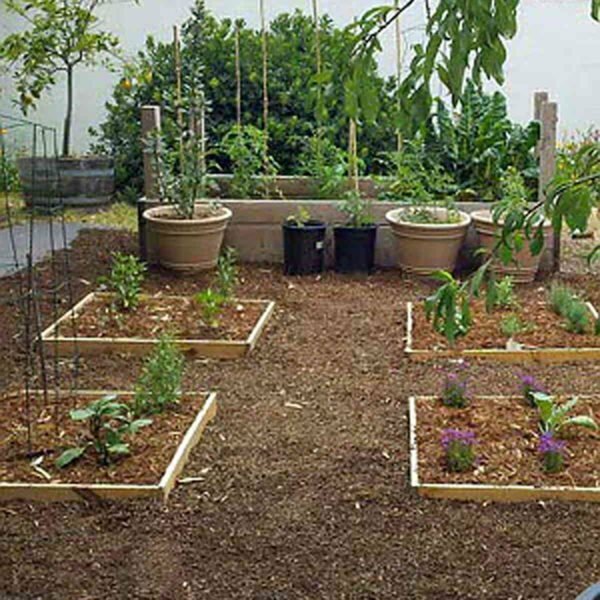 Cut down on your grocery bill by growing some food in your side yard. You can fit a surprising number of potted plants in even the smallest of side yards. Container gardening will work better if the side yard gets a fair amount of sunlight, but there are quite a few plants that grow well in any lighting conditions. What if your side yard is really narrow, or has utility cables under it, or the ground is terrible? Forget planting. Fill it in with pea gravel and some large flat river rocks to make an attractive-looking walkway. Hanging some paper lanterns from the fence or the roof adds a serene touch, as do rope lights. Even if your side yard is narrow, you may have enough room to create a small patio. Cover an area with pea gravel, put some patio furniture on it, and surround the area with a few shrubs and flowers. Press some bricks into the ground to create a brick walkway. This takes some work, but it’s definitely something you can do yourself, even without experience at similar projects.